I couldn’t find an appropriate pic, so we’ll default to a classic shot of the Lovely Sara Scott from back in the day. Local junior and senior high school athletes from the Wolves Athletics Club have been active over the past two weeks in regional and provincial competitions. At the NW Zone Track and Field Track and Field Championships in Grande Prairie on May 29 and 30 a number of long standing Zone records fell in the distance races races. The grade 9 duo of Danae Keddie (St Joes) and Brittany Duval (Eaglesham) set new marks in the Senior Girls category. Keddie clocked a time of 5:20 in the 1500m, while Duval ran 12:04 for the 3000m. Keddie also won the 800m (2:37). Mirelle Martens (St Joes) had the performance of the meet in the Senior Womens 1500. In her first ever high school race, Martens recorded a time of 5:00.0 breaking 2002 National Junior Champion Jenna Huber’s standard. Martens also notched wins in the 800 (2:31) and 3000 (10:47). Her 3000m time was the fastest of the day for both genders. Wolves Athletics Club runner Dylan Zambonelli had a pair of wins in the Senior Mens 400 (55) and 800 (2:10). 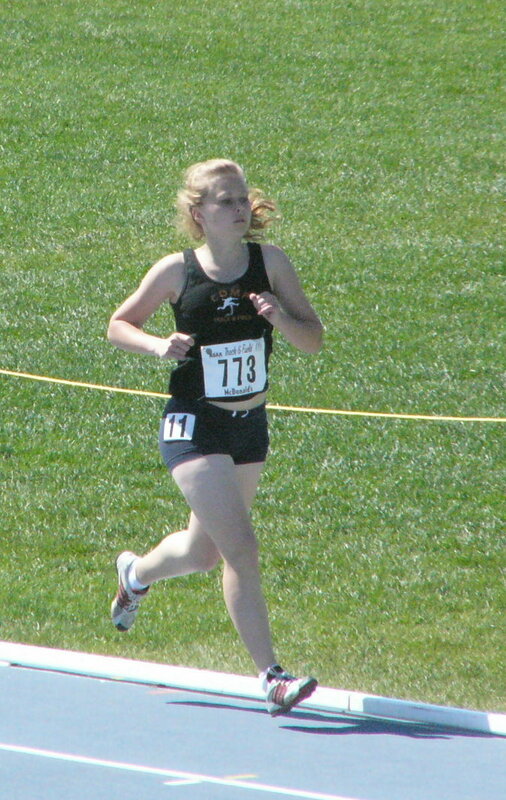 At the ASAA High School Championships in Calgary on June 7 and 8, Martens continued her winning ways by capturing the provincial Senior Girls title in the 3000m, clocking a time of 10:34. She also added the silver medal in the 1500m (4:49) and 6th place in the 800m (2:29). All three times were personal bests. Peace River’s Rylee Armstrong was also a double medalist, taking gold in the Senior Womens high jump (1.64m) and silver in the long jump. This entry was posted in Outdoor Track and Field, Uncategorized and tagged 2013, ASAA, Calgary, Eaglesham, Grande Prairie, High school, NW Zone Track, Peace Country, St Joesph, Track & Field, Wolves Athletics Club. Bookmark the permalink.